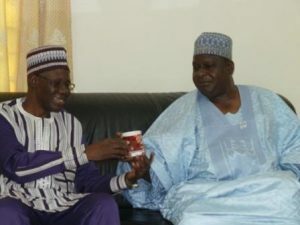 L – R: HE SEM Piabie Firmin Gregoire N’DO, Ambassador of Burkina Faso to Nigeria receiving a made in Nigeria cup from Otunba Olusegun Runsewe, Director General, NCAC during a courtesy visit paid at the Burkina Faso Embassy. 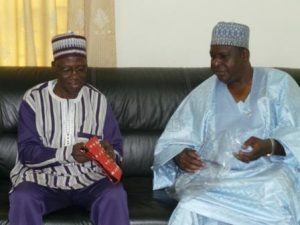 L – R: HE SEM Piabie Firmin Gregoire N’DO, Ambassador of Burkina Faso to Nigeria admiring an adire souvenir presented to him by Otunba Olusegun Runsewe, Director General, NCAC during a courtesy visit paid at the Burkina Faso Embassy. 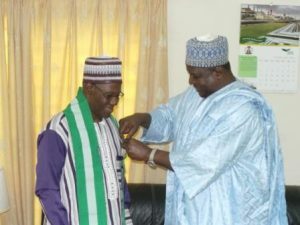 R – L: Otunba Olusegun Runsewe, Director General, NCAC decorating HE SEM Piabie Firmin Gregoire N’DO, Ambassador of Burkina Faso to Nigeria with the Council’s pin crest and Nigeria Muffler during a courtesy visit paid at the Burkina Faso Embassy. 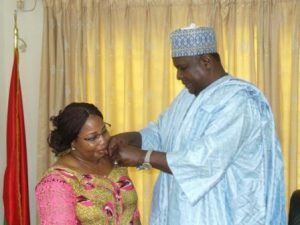 R – L: Otunba Olusegun Runsewe, Director General, NCAC decorating HE, The Deputy Ambassador of Burkina Faso to Nigeria with the Council’s pin crest. 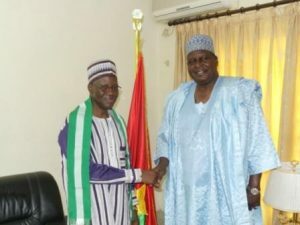 R – L: Otunba Olusegun Runsewe, Director General, NCAC in a warm handshake with HE SEM Piabie Firmin Gregoire N’DO, Ambassador of Burkina Faso to Nigeria. 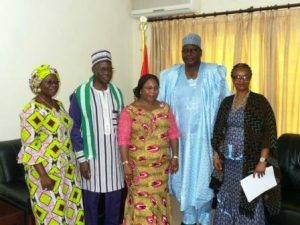 Group Photograph of NCAC Team and Officials of the Burkina Faso Embassy.